You are here: Home / Natural and green / Breathe Easy – What’s Hidden Below Your Feet? 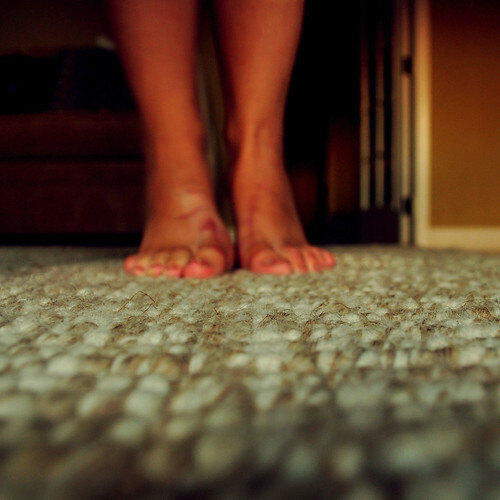 Breathe Easy – What’s Hidden Below Your Feet? When I walk into a freshly carpeted room, I often get a cozy feeling. Most varieties of carpet make the floor cushy and comfortable, while also helping control noise levels, preventing echoing within walls. What I don’t normally consider, is what lies underneath the cushy surface. The hidden dust, dander, and dirt; all hidden air pollutants that decrease the quality of air in homes. In the case of older homes with older carpet, often times there is hidden mold, mildew and bacteria, embedded deep below the surface. Still, new carpet doesn’t mean your out of the clear either. Most carpets are made from synthetic fibers, whose manufacturing processes contain many harmful chemicals that are continuously released into the air. Carpet padding, and the adhesive glue used to lay carpets can also release irritating, potentially harmful chemicals. Our home is seven years old, and we recently finished an addition onto our main level. In deciding what flooring to go with, all of what I’ve shared, was taken into consideration. We already had carpet in our living room, that was desperately in need of being replaced, and the laminate in our kitchen, dining, and hallway had been discontinued and was no longer available to order. So we needed to decide between new laminate throughout the entire main living area, or new carpet in the new room, and living room. It wasn’t exactly an easy decision. Laminate is not much better when it comes to how it is manufactured and the chemicals involved; that of which can also lead to potentially harmful off gassing. In my efforts to help keep the air we breathe inside our home clean, and help us breathe a little easier, choosing the best flooring option was my next step in promoting cleaner air in our home. We ended up deciding to go with laminate. I did quite a bit of research, and based on what I found and our budget, we decided to go with a product made by Harmonics (Golden Aspen). It is a product designed specifically for Costco stores. I liked that it was made in the USA, and that environmental friendliness was considered by the company, being it is a CARB compliant flooring that is also made of 74% pre-consumer recycled material. Sure there were healthier, “greener”, options available; but we did the best with the budget we were working with, and figured (hoped) a lot of the off gassing had already occurred between shipping, storage, and sale. We didn’t experience any noticeable health changes, and made sure to keep windows open for a time everyday, to allow for good ventilation. Now there is one area where I am not fond of hard floors; that area being the basement. We will never consider a hard flooring for our basement, as we like the feel the carpet adds to the area. It makes it feel cozy and warm. Whereas I can imagine hard floor on concrete making it feel just the opposite. I also open our windows when weather permits. Still, I know there are hidden messes lying beneath the surface. And for that reason we do plan to replace it within the next couple of years, and will look for a more environmentally friendly option than what we have, when that time comes. Included are a couple of pictures I took of our stairs after we took the carpeting up (we plan to put wood down, as our budget allows). I was AMAZED at the amount of dirt and sand that was beneath the pad. The living room area was not nearly as dirty underneath, as our stairs were. Definitely something to consider if your stairs are a high-traffic area like ours are! What steps have you taken to promote a cleaner air quality in your home?